The markets of Seoul are well known and loved around the world so an early visit to one of them was an absolute must. I chose Kwangjang mainly for proximity to both my hotel and my cultural target for the day, the Changyeonggung Palace and gardens. Having waded through the weird and wonderful selection of clothes, household items and pretty much anything else you could possibly imagine, I first hit the tanks of live seafood, with little restaurants in behind them to cook you the ultra fresh produce. I was essentially visiting at a breakfast hours so pressed on in hope of something a little more instantly appealing. I soon hit upon row after row of stalls offering traditional Korean snack favourites, much of which I was familiar with from trip to the Korean restaurants in Edinburgh. I sat down at the beckoning of a smiley woman who was light on patrons. I have no idea what her stall was called but she was a complete joy to be around throughout despite us only having very basic language in common. 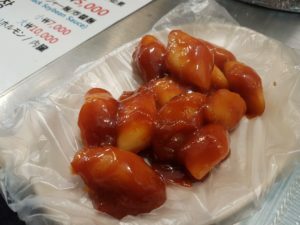 I had a fair appetite so I ordered gimbap sushi rolls, classic tteok bokki rice cakes and some fried dumplings. 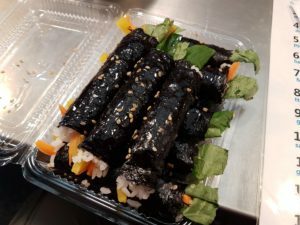 The rice cakes were bubbling away as I arrived, so were ladled up immediately and the sushi rolls quickly followed. The dumplings were fried to order. Everything was deeply satisfying with the glutinous rice cakes a hearty favourite, the gimbap suitably fresh, and the prawn and veg dumplings particularly well crafted. So overall, it was a real pleasure to wander around and soak in the aromas of Kwangjang Market. I enjoyed everything I ate and would happily eat it all – and more – again. 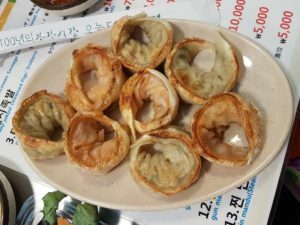 Kwangjang is a must visit on any trip to Seoul so make sure it’s on your list. I drank: maybe tripe stock?